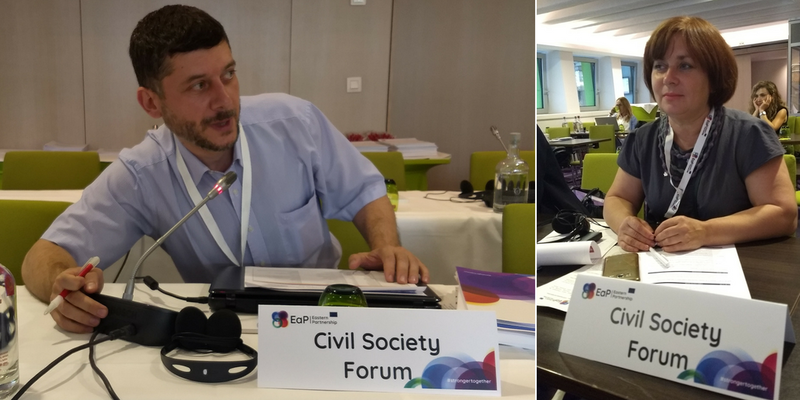 On 5 July 2018, the Eastern Partnership Civil Society Forum (EaP CSF) contributed to the EaP Panel on Education, Youth and Culture that took place in Brussels under the Platform 4 “Mobility and People to People Contacts” of the Eastern Partnership. The Forum was represented by Liliana Postan, from Labor Institute (Moldova), and Hovsep Khurshudyan, from Free Citizen Civic Initiatives Support Center (Armenia). Furthermore, EaP CSF members Grigori Yeritsyan, from Progressive Youth Armenia, Mariia Symonova, from MITLA (Ukraine), and Oleg Zhyvotovskyy, from European Choice (Ukraine), attended the meeting. Furthermore, the EaP CSF position paper also recommends the EU to contribute to this process by providing qualitative indicators; facilitating access of lifelong learning programmes; contributing to make EaP education systems more attractive; and supporting an increase on the budget for the education sector, especially in rural areas and conflict zones. During the Annual Working Group 4 Meeting, our members developed messages to deliver at the Panel on Education, Youth and Culture, as well to the EU stakeholders who attended the meeting. They elaborated on youth employability and entrepreneurship, culture, peace building and contacts between seniors.